Create a new experience for your diners with an excellent interactive presentation and a new combination of flavor and texture. 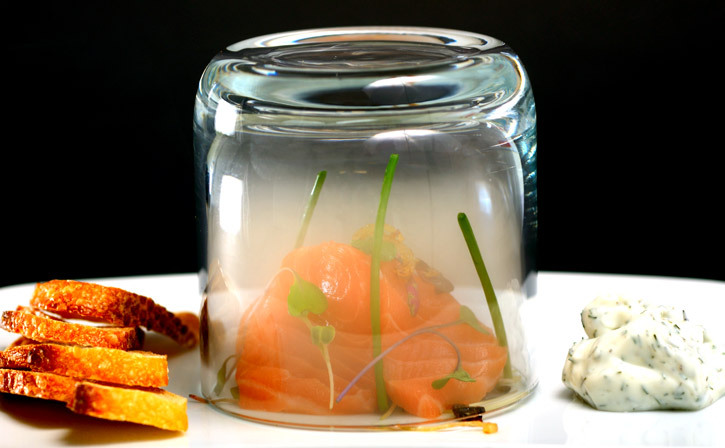 The raw salmon is smoked tableside under a glass with mesquite smoke using the Smoking Gun. The glass is then removed in front of the diner to release the smoke and uncover a delicious smoked raw salmon. The smoked raw salmon is sprinkled with crispy shallots and micro greens and it is served with toasted baguette slices and a dill cream. Because the smoke from the Smoking Gun is cool, the raw salmon is smoked without being cooked and thus maintaining its silky and moist texture, creating an exciting and original combination of flavor and texture. Blow smoke into upside down glass, place smoke-filled glass over plated food, serve and remove at table in front of diner. It will provide the diner with an immediate sense of pleasure and anticipation when the dish is uncovered. 1- Whisk sour cream, finely chopped fresh dill, and lemon juice in small bowl to blend. 2- Season to taste with salt and pepper. Store in the fridge until serving time. 1- Melt butter with olive oil in small skillet over medium-high heat. 2- Add thinly sliced shallot and sauté until golden brown. 3- Transfer sautéed shallots to paper towels to remove any oil excess. Let stand at room temperature and serve within a couple of hours to maintain crispiness. 1- In center of plate arrange a bunch of micro greens and slightly press with your fingers so they stay in place. 2- Arrange three slices of raw salmon on top of the micro greens. Make sure the arrangement fits inside the glass you are planning to use to capture the smoke. 4- Sprinkle a few micro green leaves on the salmon to add some color. 5- Arrange 3 baguette slices on one side of the plate. 6- Place a tablespoon of dill cream on the other side. 7- Get your Smoking Gun ready with Mesquite wood chips. 8- Holding the glass upside down and close to the assembled dish, fill it with smoke and place it on top of the raw salmon immediately. Serve.